Sounding Stones consists of four six-foot square granite blocks of various lengths and contours on top. Each contains an inverted water fountain and has a viewing circle on two sides which permits seeing through all for cubes simultaneously. The size, location and shape of the blocks reflect the artist’s concern with the notion of place, point of view and the contrast between artificial and natural, public and private. 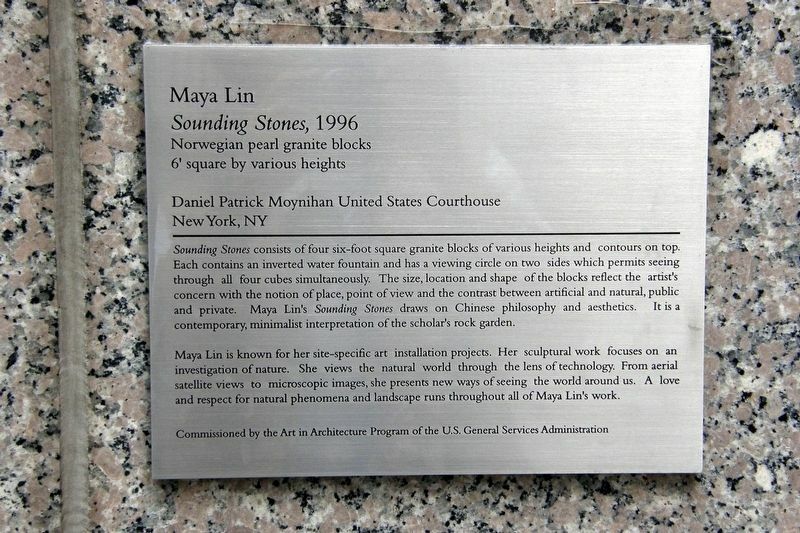 Maya Lin’s Sounding Stones draws on Chinese philosophy and aesthetics. It is a contemporary, minimalist interpretation of the scholar’s rock garden. The Moynihan Courthouse to the left. The marker is on the building wall near the furthest stone. Erected 1996 by the Art in Architecture Program of the U.S. General Services Administration. Location. 40° 42.836′ N, 74° 0.066′ W. Marker is in New York, New York, in New York County. Marker can be reached from Worth Street. Touch for map. Marker is in this post office area: New York NY 10007, United States of America. Touch for directions. Other nearby markers. At least 8 other markers are within walking distance of this marker. New York County Court House (about 300 feet away, measured in a direct line); Welcome to Columbus Park (was about 400 feet away but has been reported missing. ); Foley Square Before 1600 (about 400 feet away); Patrick Cardinal Hayes (about 400 feet away); Triumph of the Human Spirit (about 500 feet away); First National Sunday School Convention (about 500 feet away); Foley Square c. 1880 (about 500 feet away); Thomas Paine Park (about 600 feet away). Touch for a list and map of all markers in New York. More about this marker. 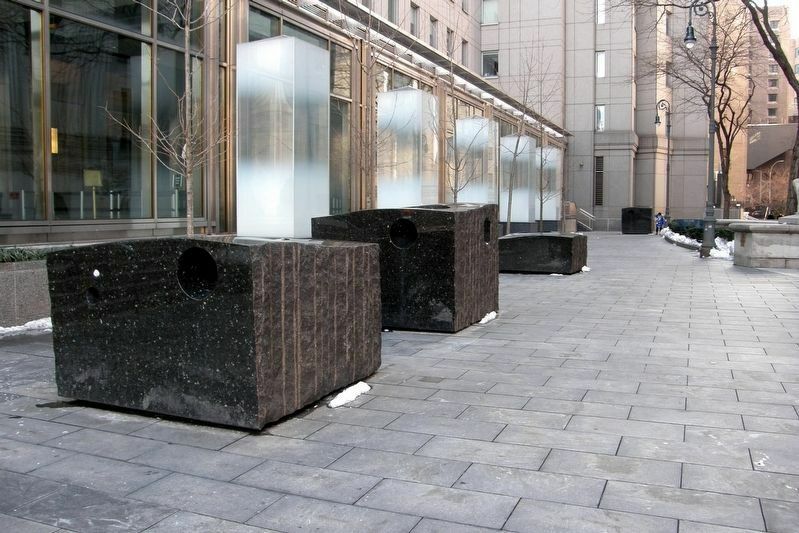 The marker/sculpture is in the plaza between the New York State Supreme Court and the Daniel Patrick Moynihan United States Courthouse buildings in Foley Square. More. Search the internet for Sounding Stones. Credits. This page was last revised on March 11, 2019. This page originally submitted on March 8, 2019, by Larry Gertner of New York, New York. This page has been viewed 54 times since then. Photos: 1, 2. submitted on March 8, 2019, by Larry Gertner of New York, New York. • Bill Pfingsten was the editor who published this page.